A full-day event of speakers and discussion takes place at Wellesley College and live online on February 22, 2014, thanks to TEDxWellesleyCollege. The conference is built on the model of TED, an internationally acclaimed forum for inspiring ideas, communicated through story telling and engaging narratives. Philosophy Major Yong Wei Chong Gabriel '14, and economics major Cicia Lee '14, both fans of TED talks, established TEDxWellesleyCollege. The TEDxWellesleyCollege organizing committee comprises approximately 20 Wellesley student volunteers, dedicated to bringing TED to campus. The conference has received wide support from academic departments at the College and is primarily funded by the Committee on Lectures and Cultural Events. In the spirit of “ideas worth spreading,” TEDx is a program of local, self-organized events that bring people together to share a TED-like experience. At a TEDx event, TEDTalks videos and live speakers combine to spark deep discussion and connection in a small group. These local, self-organized events are branded TEDx, where x = independently organized TED event. The TED Conference provides general guidance for the program, but individual TEDx events are self-organized, subject to certain rules and regulations. 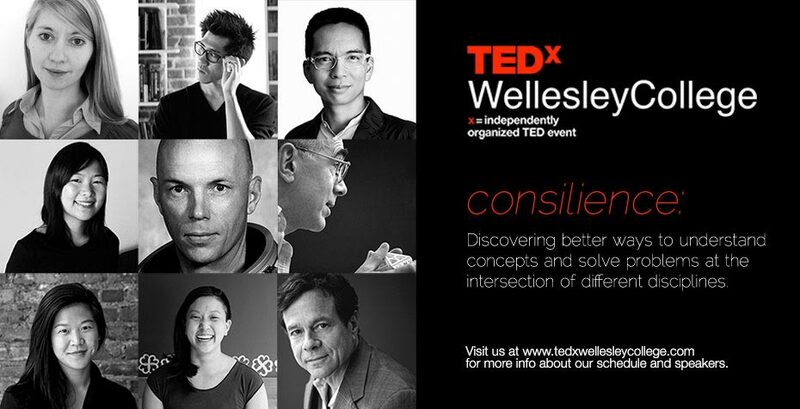 The theme for the inaugural TEDxWellesleyCollege conference is “consilience.” In his critically acclaimed book titled Consilience, Edward O. Wilson argued that the integration between the natural sciences, social sciences, and humanities is necessary for solving the greatest challenges facing our civilization. Inspired by the idea of consilience, and discovering it a perfect fit for Wellesley's multidisciplinary liberal arts tradition, TEDxWellesleyCollege is dedicated to the union of disciplines, industries, and diverging perspectives. To arrive at the speaker roster, the planning team had a "curating committee,” and each curating member came up with several different speaker possibilities. At a fall team retreat, each presented the speakers and the group assessed them according to several factors (relevance to theme, speaker engagement, likelihood of attending, etc). After voting, team members reached out to the speakers they thought fit best mostly via email or through contacts to ask if they would come. The TEDxWellesleyCollege team is excited to bring together a wide range of topics and speaker backgrounds that will foster intellectual discussion among members of the Wellesley community, and beyond. TEDxWellesleyCollege will be held at the Ruth Nagel Jones Theatre in Alumnae Hall on the Wellesley College campus. Wellesley students registered earlier in the month for the opportunity to listen to speakers in a small, personal setting. Registration is closed but the organizers will invite walk-ins there are empty seats 10 minutes before the start time. Other students and members of the public are welcome to attend the live simulcast of the conference and receptions to be held in Diana Chapman Walsh Alumnae Hall. Admission is free. The conference runs from 9 a.m. to 6 p.m., and doors will open at 8 a.m. The talks will also be livestreamed at WellesleyLive. The day is broken into four sessions, each of which will feature a TEDx video followed by three speakers. Light refreshments will be served between each session. The full schedule of the conference is available at www.tedxwellesleycollege.com. Video recordings of the talks will be submitted to TEDx after the event. For further information or to request media seats, please contact tedxwellesleycollege-exec@wellesley.edu. TED is a nonprofit organization devoted to, as its tagline puts it, “Ideas Worth Spreading.” Started as a four-day conference in California 26 years ago, TED has grown to support those world-changing ideas with multiple initiatives. At TED, the world’s leading thinkers and doers are asked to give the talk of their lives in 18 minutes. Talks are then made available, free, at TED.com. TED speakers have included Isabel Allende, Sir Richard Branson, former UK Prime Minister Gordon Brown, Bill Gates, Elizabeth Gilbert, Jane Goodall, Benoit Mandelbrot, Ngozi Okonjo-Iweala, and Philippe Starck, to name just a handful. Two major TED events are held each year: The TED Conference takes place every spring in Long Beach, California (along with a parallel conference, TEDActive, in Palm Springs), and TEDGlobal is held each summer in Edinburgh, Scotland.